1 Left, The Innov-ís 2800D offers a color LCD touch screen, a 6 inch x 10 inch embroidery area and precise stitching for all your sewing, quilting, and embroidery projects. The exclusive built-in dual USB ports allow you to connect your machine directly to your computer or access a variety of additional memory devices (not included). Powerful on-screen editing features include layout, pattern rotation in 1 degree increments, mirror imaging and scaling. Oversized, high-resolution color LCD screen. 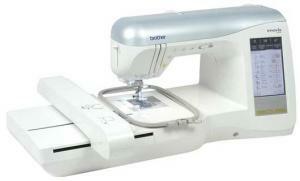 Select stitches, embroidery patterns, tutorials and more by simply touching the screen. Sewing Workspace: 8" x 5"
Max. Emb. Area: 6" x 10"
Included Embroidery Hoops: 6" x 10", 5" x 7", 4" x 4"